Ella Publishing Co. has another great release this month called Design Workshop by Lisa Dickinson. There are many reasons that I love scrapbooking, but the ability to be creative through design is certainly at the top of the list. Any time I have a chance to learn something new or be inspired by good design in the form of scrapbooking, I'm eager to take it all in. Who better to learn from than professional graphic designer Lisa Dickinson...who just also happens to be an excellent scrap artist as well?! "Recently, I've realized that scrapbooking supplies and trends found in magazines and online can sometimes act like demanding clients - bombarding you with new techniques, ideas, and materials to try. It's natural to want to try the latest and greatest approaches, but it's also very easy to get overwhelmed." In this eBook, Dickinson offer her 10 favorite design concepts with an clear explanation on how to put them to work to create stunning layouts. She also includes two wonderful layout variations to illustrate that there are many ways to make a concept come alive on your layouts. "Quite simply, a grid creates instant visual organization" and Dickinson shows you how to achieve the look without feeling 'boxed in'. This has even been a struggle for me at times and Dickinson offered my new tricks to help overcome my inhibitions by offering two no-fail ways to combine with confidence. There are many things that can make including memorabilia difficult (and sometimes impossible), but Dickinson has a couple tricks up her sleeve that make anything possible! 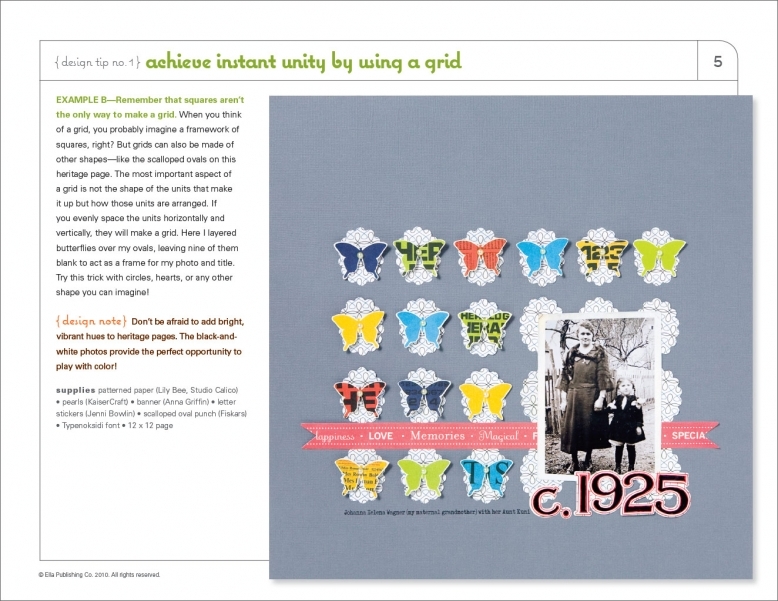 "When you group similar items together...your page accents are more noticeable and often more pleasing to view." However, there are certain things to keep in mind when creating successful groups and Dickinson will clue you in to great grouping! Dickinson offers strategies for adding dimension to a craft that is largely two-dimensional - instantly adding interest to your layouts. "Color is a powerful design element." Yes...one that can quickly go awry if not used effectively. Dickinson shares two tried-and-true techniques to successful color palettes. 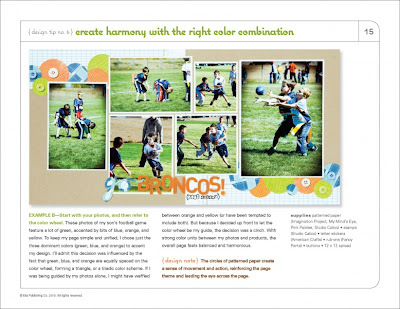 Dickinson says that one should "never underestimate the richness texture can add to a design" and shows exactly how much impact it can have in her layout examples. While I try to keep the number of fonts that I have on my computer at any one time, I am still a total font junkie! Dickinson gives me more reason to love my fonts (and more ideas for using them) in this chapter by proving that they're not just for titles and journaling. Use of lines is a important technique in photography. Why not apply it to layouts as well? They can be used in many ways and can actually help to achieve the 'mood' your hoping to express. Dickinson shows that sometimes the best layouts can result from 'fudging' the rules a bit and includes 4 sample layouts in this final section to prove it. Overall, there are 22 samples layouts to drool over and each one comes with an addition product or design tip which points out an additional factor that lends to the layouts successful design. 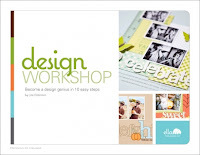 If you're looking for a little inspiration on putting it all together, Design Workshop is for you!! When it comes scrapbook design techniques, do you consider yourself a pro, amateur or novice? Leave your comment by Thursday, June 3, 2010, 11:59 p.m. and Random.org will choose the lucky winner. Be sure to check back to see if you're the winner!